Legends about the origin of this festivity abound. One holds that over 3,000 years ago sacrificial rites called La (腊) were held in the twelfth lunar month when people offered up their preys to the gods of heaven and earth. The Chinese characters for prey (猎物) and the twelfth month (腊 La) were interchangeable then, and ever since La has been used to refer to both. Since the festival was held on the eighth day of the Last month, people later appended the number eight (ba in Chinese), giving us the current Laba. Buddhism was well accepted in the areas inhabited by the Han Chinese, who believed that Sakyamuni, the first Buddha and founder of the religion, attained enlightenment on the eighth day of the twelfth month. Sutras were chanted in the temples and rice porridge with beans, nuts and dried fruit was prepared for the Buddha. With the passing of time the custom extended, especially in rural areas where peasants would pray for a plentiful harvest in this way. There is, however, another touching story: When Sakyamuni was on his way into the high mountains in his quest for understanding and enlightenment, he grew tired and hungry. Exhausted from days of walking, he passed into unconsciousness by a river in India. A shepherdess found him there and fed him her lunch -- porridge made with beans and rice. Sakyamuni was thus able to continue his journey. After six years of strict discipline, he finally realized his dream of full enlightenment on the eighth day of the twelfth lunar month. Ever since, monks have prepared rice porridge on the eve and held a ceremony the following day, during which they chant sutras and offer porridge to Buddha. Thus, the tradition of eating Laba porridge was based in religion, though with the passing of time the food itself became a popular winter dish especially in cold northern China. According to written records, large Buddhist temples would offer Laba rice porridge to the poor to show their faith to Buddha. In the Ming Dynasty about 500 years ago, it became such a holy food that emperors would offer it to their officials during festivals. As it gained favor in the feudal upper class, it also quickly became popular throughout the country. Laba rice porridge contains glutinous rice, red beans, millet, Chinese sorghum, peas, dried lotus seeds, red beans and some other ingredients, such as dried dates, chestnut meat, walnut meat, almond, peanut, etc. Actually eight ingredients are used, cooked with sugar to make the porridge tasty. 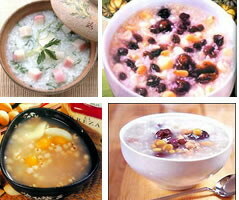 Northerners prefer to use glutinous rice, red beans, dates, lotus seeds, dried long'an pulp, walnuts, pine nuts and other dried fruits in their porridge; southerners like a salty porridge prepared with rice, soybeans, peanuts, broad beans, taro, water chestnuts, walnuts, vegetables and diced meat. In the north, it is a dessert with sugar added; in the south, salt is put in. Some people like to add cinnamon and other condiments to add flavor. Controlling the heat is of great importance in making Laba porridge. At the start, the flame must be high, but the fire is then turned down to let the porridge simmer until it begins to emit a very delicious smell. The process is time-consuming but not complicated. Laba porridge is not only easy to prepare, but also a nutritious winter food because it contains amino acids, protein, vitamins and other nutrition people need. Cooked nuts and dried fruit are good for soothing nerves, nourishing one's heart and vitality, and strengthening the spleen. Perhaps that is why it is also called babao (Eight Treasure) porridge. A bit spurrised it seems to simple and yet useful.